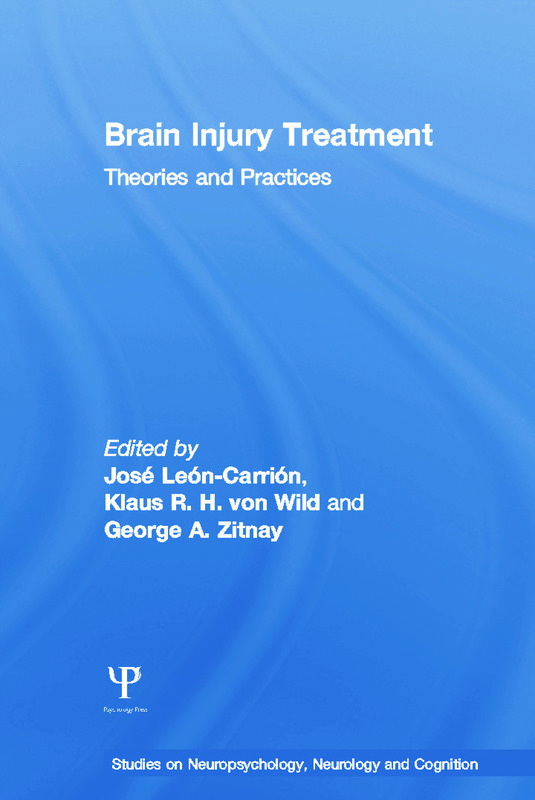 Brain Injury Treatment: Theories and Practices is a thorough and wide-ranging account of the rehabilitation of brain injury. Written from an international perspective, this book presents a detailed discussion of the basic science of brain injury. It explains the treatments used in brain injury rehabilitation and covers new methods of rehabilitation, including complementary medicine theories. It contains a wealth of information on different neurosurgical and neuropsychological treatments. It also includes a comprehensive reference to the theories underlying rehabilitation practices and chapters on community reentry and family dynamics following brain injury. It will be an invaluable tool to students from psychology, medicine, physical and occupational therapy studying the treatment and aftercare of people with brain injury. Andy Jagoda, John Bruns, Prehospital Management of Traumatic Brain Injury. M. A. Munoz-Sanchez, F. Murillo, Jose Leon-Carrion, Mild Brain Injury: Detecting High Risk Patients. Jose Maria Dominguez-Roldan, Claudio Garcia-Alfaro, Walter Videtta, 3 – Organization of Neurological Intensive Care Units. Klaus R. H. von Wild, Current Concepts and Strategies on Early Neurohabilitation for Patients with Traumatic Injury (TBI). Edwin Cooper, Tetsuo Kanno, Electrical Treatment of Coma. Jose Leon-Carrion, Maria del Rosario Dominguez-Morales, Jose Maria Dominguez-Roldan, Low-level responsive states. Dale F. Thomas, Jose Leon-Carrion, Diagnosing and treating affective disorders after brain injury. Antonio Vela Bueno, E O Bixler, A N Vgontzas, Sleep Disorders in Patients with Traumatic Brain Injury. Jose Leon-Carrion, Eugene Mikhaelenov, Rosario Dominguez-Morales, Olga Voronina, Rehabilitation of Equilibrium and Posture Control after Brain Injury. Nathan D. Zasler, Michael F. Martelli, Neuropharmacological Management of Impairment after Traumatic Brain Injury. John S. Hong, Christopher G. Zitnay, Spasticity of Cerebral Origin. Gianpietro Salvi, Annamaria Quarenghi, Paola Quarenghi, Rehabilitation in Water. Jose Leon-Carrion, Paul J. Taffe, Juan Manuel Barroso y Martin, Neuropsychological Assessment of Persons with Acquired Brain Injury. Jose Leon-Carrion, Sevilla Neuropsychological test-Battery (BNS) for the assessment of Executive Functioning. Jose Leon-Carrion, Methods and Tools for the Assessment of Outcome after Brain Injury Rehabilitation. Michael F. Martelli, Nathan D. Zasler, Shane S. Bush, Assessment of Response Bias in Impairment and Disability Examinations. Jose Leon-Carrion, Rehabilitation of Cognitive Disorders after Acquired Brain Injury: The Combine Method (TCM). Peter D. Patrick, Sean T. Patrick, Erin Duncan, Neuropsychological Recovery: Children & Adolescents Following Traumatic Brain Injury. Claudio Perine, Paolo Pietrapiana, Enrico Fiorio, Andrea Maestri, Roberto Rago, Medical Rehabilitation of TBI after Intensive Care. Jose Leon-Carrion, Maria del Rosario Dominguez-Morales, The holistic, multidisciplinary and intensive approach of treatment: the CRECER method. Jose Leon-Carrion, the Role of Stem Cells in the Rehabilitation of Brain Injury. George A Zitnay, Professor, Complementary Medicine and TBI. Jose Leon-Carrion, Claudio Perino, George Zitnay, The Role of Family in the Rehabilitation of Traumatic Brain Injury Patients: Advocate or Co-Therapist. Davide Verne, Tiziana Mezzanato, Elina Caminiti, Return to Work after Brain Injury. Jose Leon-Carrion is Professor of Neuropsychology and Director of the Human Neuropsychology Laboratory at the University of Seville, Spain. At the Center for Brain Injury Rehabilitation (C.RE.CER.) in Seville, an interdisciplinary center for rehabilitation, he is responsible for the design of the rehabilitation programs and director of the Department of Research, Development and Innovation. He was vice-president of the International Brain Injury Association (IBIA) and is currently Secretary General on the Board of Directors of IBIA. He also was president of the Academy for the Advancement of Brain Injury Rehabilitation. George A. Zitnay is Clinical Professor at the Medical College of Virginia, he is the immediate past President of the Brain Injury Association of America, Founder and immediate past President of the International Brain Injury Association, Chairman of the WHO Neurotrauma Committee, former Chairman of the Council of the Medical Rehabilitation Center at NIH, Chairman of the National Brain Injury Research, Treatment and Training Foundation, former Professor and Director of Research at the Department of Neurosurgery at the University of Virginia, author, lecturer and member of editorial board of journal, Brain Injury. Klaus von Wild is Professor and Head Neurosurgical, Department for Neurosurgery and Early Neurotraumatological Rehabilitation, Clemenshospital, Teaching Hospital, Westphalian Wilhelms University Munster.